Bizet's masterpiece sees an updating to the last days of General Franco's dictatorship as Calixto Bieito's acclaimed production of this must-see opera returns to the London Palladium after enjoying rave reviews during its last run in 2015! Lead by special guest conductor Valentina Peleggi, the eponymous anti-heroine is once again sung by mezzo-soprano Justina Gringyte alongside the internationally acclaimed American tenor Sean Panikkar as her lover Jose. A passionate tale of lust, seduction and betrayal, the setting opens on a sweaty male barracks in the dying days of Franco's Spain. Carmen is no longer the exotic beauty who exudes sexuality - she is a common tart who takes her men where she sees fit. Don Jose is no longer the weedy, manipulated weakling of old; he is masculine, dangerous and volatile. This stripped-down, modern re-staging shines a new light on the comic tragedy, with stereotypes turned on their heads and new insights into the characters' desires, dreams and obsessions. Please note: the above images are from a past run of Carmen and do not necessarily reflect current casting. Seen Carmen? Loved it? Hated it? Sound good to you? 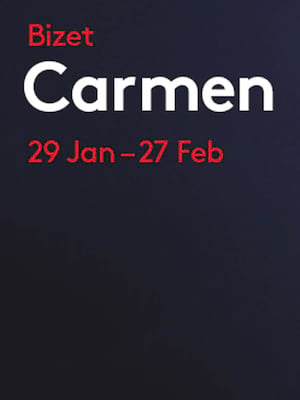 Share this page on social media and let your friends know about Carmen at London Coliseum. Please note: The term London Coliseum and/or Carmen as well as all associated graphics, logos, and/or other trademarks, tradenames or copyrights are the property of the London Coliseum and/or Carmen and are used herein for factual descriptive purposes only. We are in no way associated with or authorized by the London Coliseum and/or Carmen and neither that entity nor any of its affiliates have licensed or endorsed us to sell tickets, goods and or services in conjunction with their events.